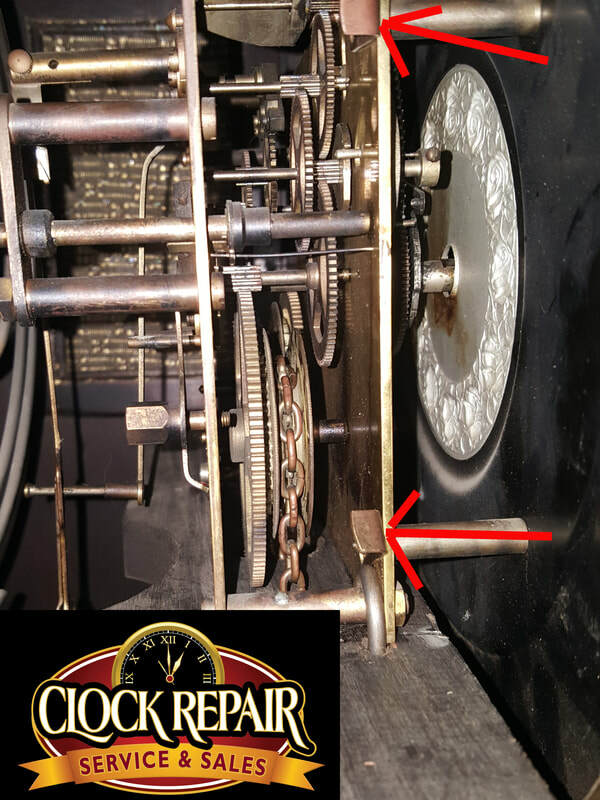 We had a service call today for a clock that will not stop striking on the hour. 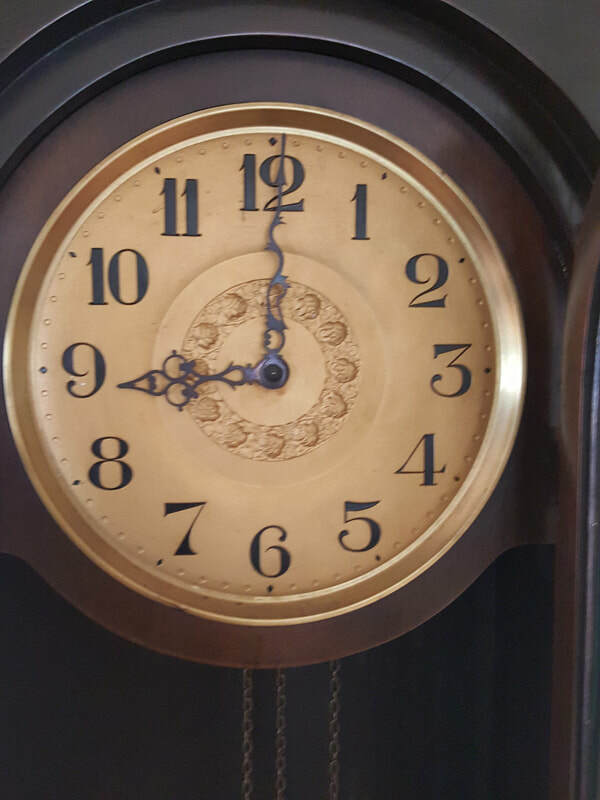 On the top of the hour, the clock would strike until the weight would run down to the bottom of the clock case and eventually stop due to running out of cable. There are a few things to check here, but This blog is about the problem we found. 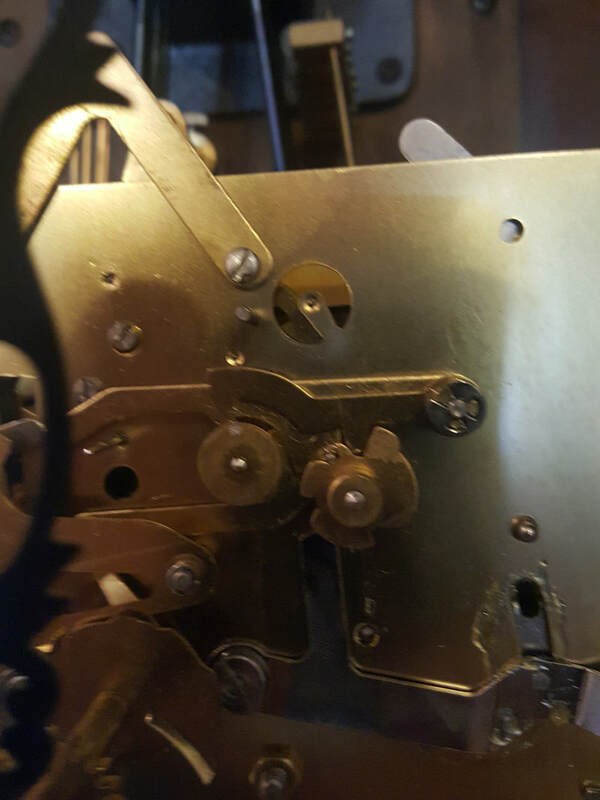 The clock striking mechanism is called a "rack and snail" on this particular grandfather clock movement. The release section of the rack part of the movement installs on a shaft as pictured. 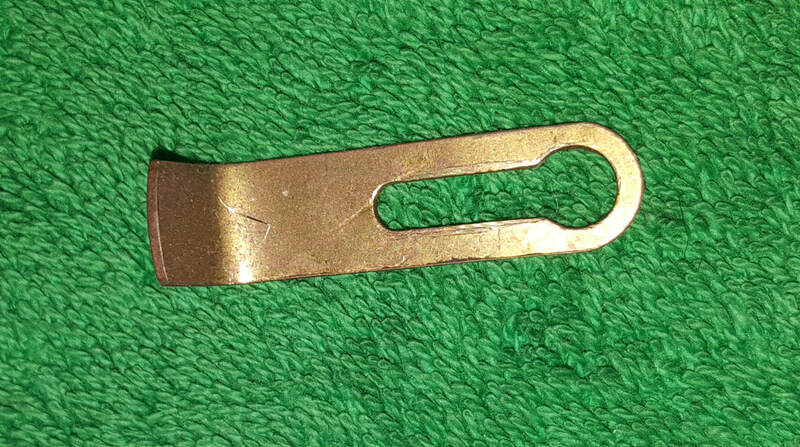 This shaft comes from the factory without any oil on it. At some point in this clocks life, someone did oil the shaft. The oil eventually dried out, collected dirt and finally gummed up turning into a sticky mess. When the lifter was lifted, it was so sticky that it would not drop back down into position. When the lifter stays in the lifted position, the rack cannot drop down to stop the clock from striking. I had to remove the black clip holding the small lift which allowed me to remove the smaller lifter. I was able to clean all the old oil and reinstalled the smaller lifter back into place. After the small lifter was re-installed, I did not add any oil to the shaft. The small as well as the large lifter were able to drop down into position and the clock operated fine. 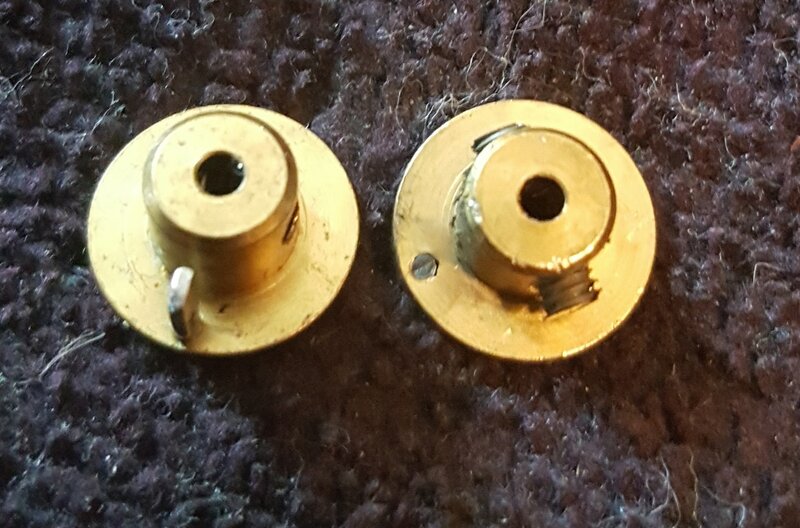 The picture to the right shows the clock movement back together. The clip was re-installed and the lifters worked as when they were new. 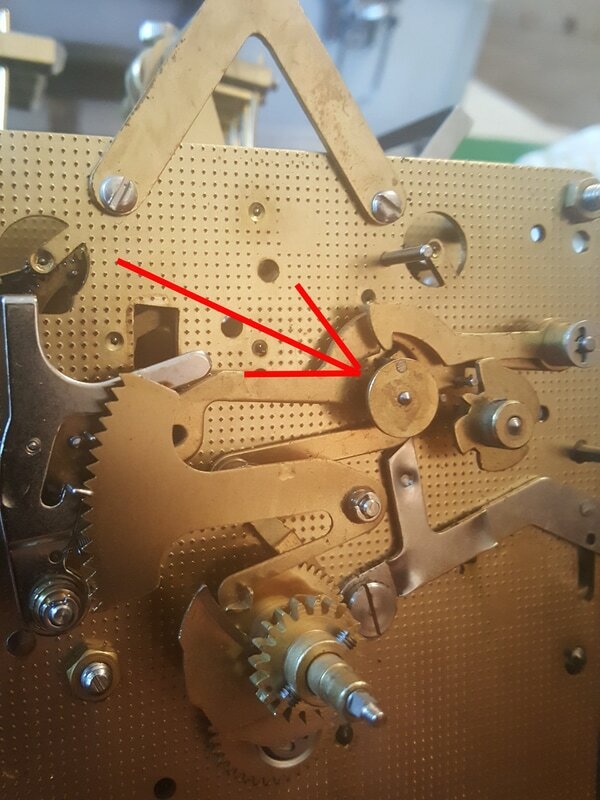 Although, many moving parts on a clock movement needs to be oiled, there are a several parts that will not benefit from oiling and some parts that will stop working with oil. What oil you use is also critical when it comes time to oil a clock movement. Most clocks from the 1990's and earlier were oiled with natural oils that will breakdown and gum up. Newer clocks have synthetic oils in them that do not break down and gum up as quickly as natural oils. 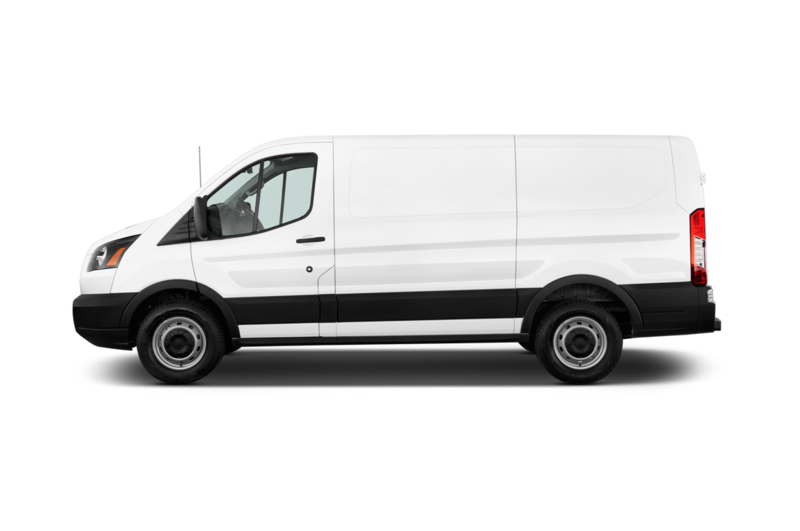 Synthetic oils vary in quality and unless you use a high quality, Premium synthetic oil, you could be damaging the clock movement and unfortunately, you will not know it until the damage is done. 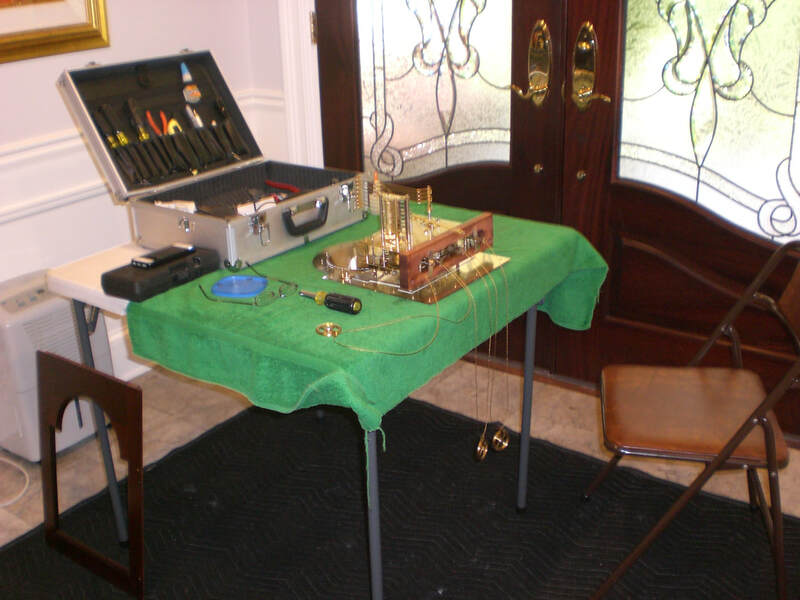 We have serviced over 4,000 clocks, mostly Grandfather clocks in the past several years. The clock oil we use is critical to our business. We have done allot of research over the years and have found a small company named Horace Whitlock that sells premium quality synthetic clock oil that is far superior to anything we have used. Of course there are several other problems that will allow a clock to continue to strike non stop and we will discuss them in another blog. ​Please feel free to contact us if you have any other questions. We get asked all the time about the moon phase calendar on a Grandfather Clock is and how does it work. The Moon phase calendar on your Grandfather Clock (and other clocks) is the Lunar calendar and has NOTHING to do with our monthly calendar. The Moon dial on your Grandfather Clock will show the phase of the moon and not the date of the month. When the moon is full it is 15 days old. It doesn't matter if the full moon falls on the 1st of the month, the 10th of the month or the 20th of the month. So when the moon is full, at 15 days old, the center of the moon on your moon dial will point strait up and the center of the moon will point to the 15, reflecting what the moon will look like at that day. In other words, if the center of the moon dial is pointing to the 15, there will be a full moon that evening. Your Moon Dial will move 1 day (or phase) each day, as long as your Grandfather CLock is running properly. If your Grandfather clock stops, so does the Moon phase Dial. When the center of the moon dial on your Grandfather clock points to the #10 the Lunar calendar is 10 days old and that will reflect what the moon will be that evening. Your Moon phase will need adjusting periodically, because the Lunar calendar is 29 1/2 days long and our monthly calendar is 30-31 days long. We always suggest to our customers to come back to our website, we have a "Moon Phase" app on the home page, so you can set your Moon Dial to the correct phase when you feel it might get off. When your Grandfather Clocks Moon Dial needs to be changed or moved, you can physically move it, simply by moving the moon dial with your hands. 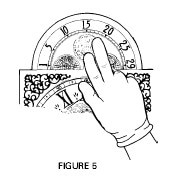 Gently take your center finger and your pointer finger and move the Grandfather Clock moon dial clockwise (as pictured above). It should move freely. 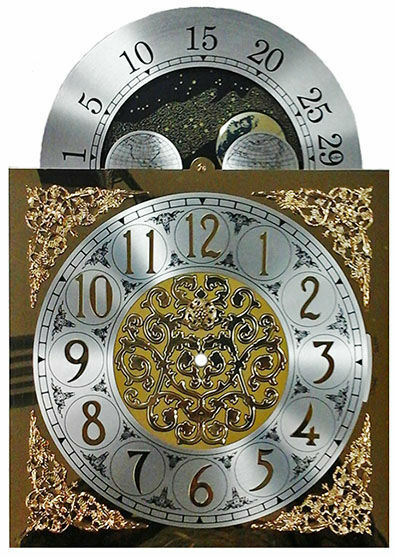 Some Grandfather clock moon dials spin freely and others have a "click stop" so you will hear the moon dial clicking as it turns. 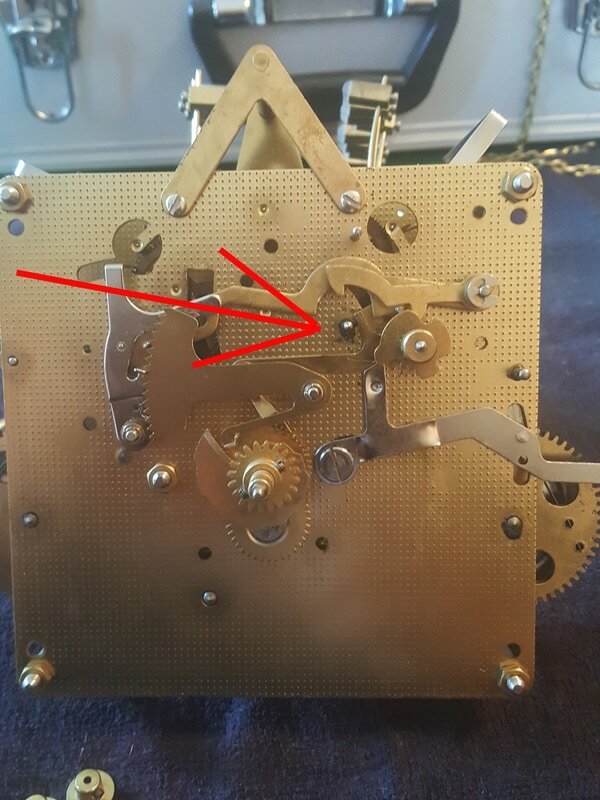 If when moving your Grandfather Clocks moon dial you feel any resistance, or the moon dial will not turn at all, stop trying to move the moon gear and come back later and try again. The Grandfather Clocks moon dial is tied into the mechanics of your Grandfather Clocks movement and the movement will turn the moon dial each day. If you feel that the moon dial will not turn, its is most likely in the process of turning through the gears on the Grandfather Clocks movement. Typically, this process will take an hour or two to fully engage and turn the moon dial to the next phase. 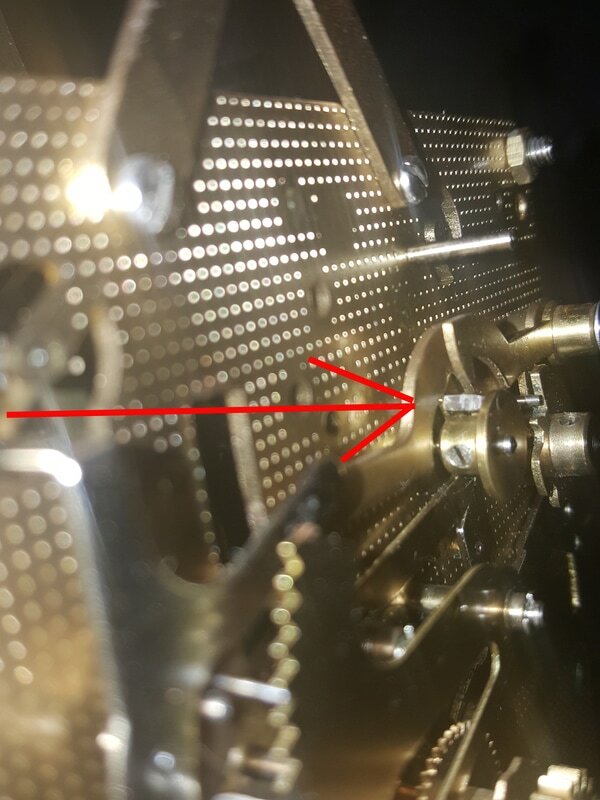 Sometimes the moon dial gears will become damaged and will not align properly. 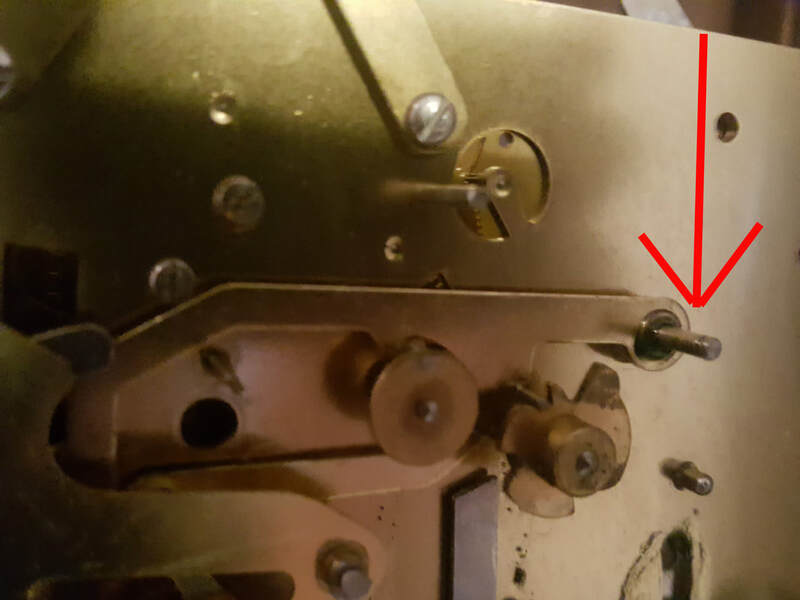 We have seen where some Grandfather Clocks have been worked on and the service person must not have understood how the Grandfather Clocks moon dial worked, therefore never aligning the gears properly to start with and the moon dial will not turn and keep up with the phase of the moon. 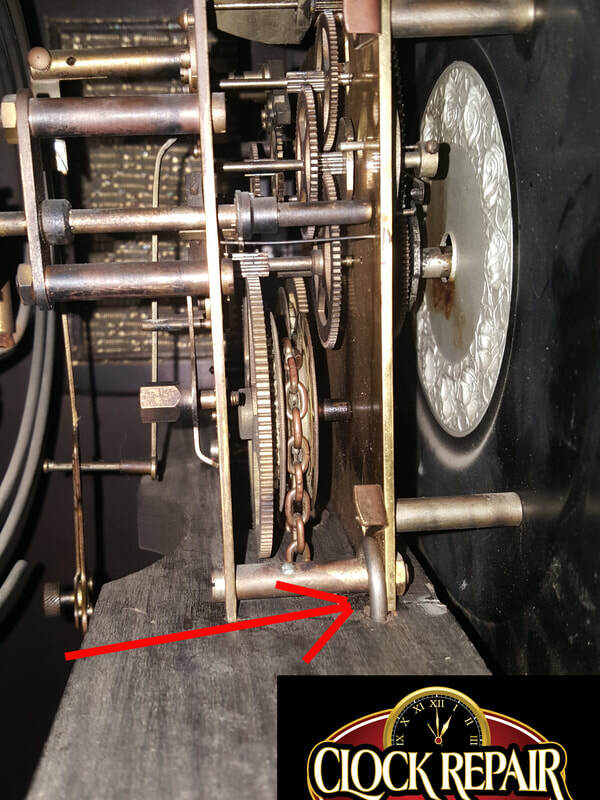 If your Grandfathers moon dial will not turn and keep with the Lunar phase, its possible that the gears are not aligned properly. Additional work will need to be performed if this is the case.